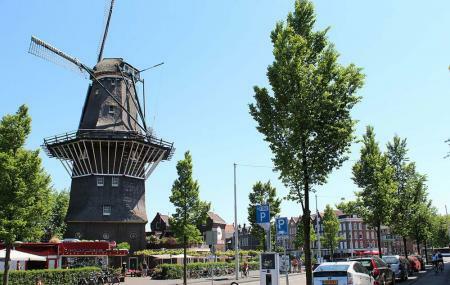 Located between Funenkade and Zeeburgerstraat De Gooyer Windmill is a stunning structure in the region. The destination is well known among tourists for its picturesque views and scenery. The place makes a perfect spot for photography and sees a lot of tourists looking for the perfect picture. The destination is the tallest wooden mill in the Netherlands and gained popularity fairly easy because of its unique design and iconic looks. Take a tram from Amsterdam, HoogteKadijk. Take a bus from Amsterdam, Oostenburgergracht. How popular is De Gooyer Windmill? People normally club together Oosterpark and Natura Artis Magistra while planning their visit to De Gooyer Windmill. A must go in Amsterdam! Take the one-day ticket. Give it a ride through Amsterdam in the morning and go by mid-day to De Gooyer and enjoy some beers by the 2 nearby bars. Awesome deal! Great beer, nice atmosphere! Enjoy! nice windmill but cannot be visited. frankly beautiful tower, the size of which is hard to imagine when you look at it from a distance. Unfortunately Google's info on the openning hours are far from correct. As far as I know now from my experience, the tower is hardly ever open for the public. I wouldn't count on it to ever be open. There's a lovely brewery right beside the tower though, where you can have a beer under the clear sky and stare at the tower in awe. Great place! Put it on your check list. Honestly not that pretty on a cold and miserable winters day. However it's still cool to see a windmill in the middle of the city. I'd like to get a beer from here in the future.